Before getting any dirt on your 4WD, it’s in everyone’s interest – yours, the environments and other off-road users - to get the other ‘dirt’ first, essential information about your vehicle and it’s capabilities. 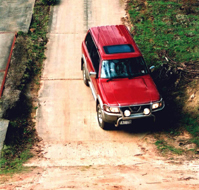 Operating from The Australian Automotive Research Centre, Adrian du Jardin of Four Wheel Drive Off Road Driver Training conducts intensive one day courses designed to equip you with the skills necessary to tackle our off-road driving challenges. Travelling far beyond the areas that normal vehicles can access, the terrain can be both threatening and vulnerable. Ensuring that you safely reach your desitantion with no vehicle damage, whilst leaving the environment unspoilt for those that follow, is a priority on all our courses.